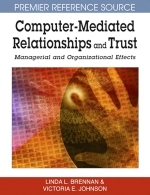 This chapter suggests that computer-mediated technologies (CMTs) facilitate organizational trust and distrust by leading to what we introduce as Virtual Assurance. Through partnering and outsourcing, organizations are exposed to managing simultaneous organizational trust and distrust. For instance, CMTs allow more precise and timely monitoring of organizations in a high trust and high distrust context, a process that leads to Virtual Assurance. We further describe Virtual Assurance as a means to manage the fragility of modern interorganizational relationships, especially when high trust and high distrust is present. We also suggest that the presence of Virtual Assurance will ultimately provide a competitive advantage to firms in making contractual agreements, tracking progress, imposing penalties, and shielding organizations from potential harm.